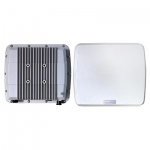 WiMESH Bridge provides reliable Ethernet connectivity over a high-performance, self-forming Wireless MESH backbone—indoor, outdoor or on the moving vehicles. It's especially critical for infrastructures where wired solutions are hard to deploy. The low latency and high throughput WiMESH features greatly enable the extension of network coverage. IP67/IP68 waterproof enclosure with wide-temperature design enables excellent performance under all harsh environments.